30 Picture Books | Shelf Elf: read, write, rave. When I tell you that You Are Stardust is a stunning book, you may think, “Yeah, yeah. Stunning, schmunning. People call books stunning all the time.” To which I reply, “No. I mean it. This book is stunning. Honest.” I don’t think I’ve been as blown away by the creativity and beauty of a book in quite a while. Elin Kelsey and Soyeon Kim should be getting some serious recognition for their work in this collaboration. This book will make kids think. It will make kids marvel. It will make them slow down and stare at the pages and then, hopefully, turn that wonder to the world around them. This is where Elin Kelsey begins her exploration of all of the ways that we are a part of the earth and its cycles and communities. 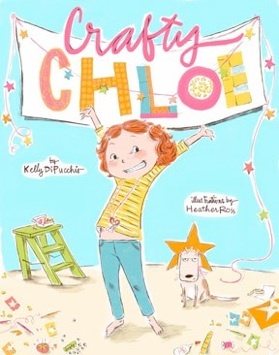 She writes with lovely directness, make each big idea clear as can be, putting them out there for kids to ponder and talk about. Indeed, the text is full of facts awesome enough to please any science geek. Did you know you sneeze with the force of a tornado, or that you’ll replace your skin 100 times by the time you turn ten? So, so cool. The best part of the words that fill this book is that they are all the more mind-blowing because they are simply describing what is. Our world, our earth, is mind-blowing, and I can’t think of another book for children that communicates this truth more effectively. 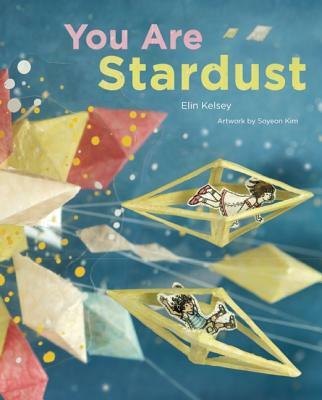 You Are Stardust is awesome, in the ideas that it offers to young readers, and the incredibly unique artwork. Jaw-dropping. Give it to everyone. Then hug a tree and whisper a few deep thoughts into the cosmos. Bam. Done. Picture Book #30! I did it! It’s been fun gang. Thanks for reading this month. You Are Stardust is published by OwlKid Books. This entry was posted in Can-Con, Illustration, Picture Books and tagged 30 Picture Books, diorama, Elin Kelsey, Owlkids Books, Soyeon Kim on September 30, 2012 by shelfelf. Yesterday was the kind of day that left me so tired that all I could manage by 10:00 pm was slouching over my computer keyboard watching animal videos (exhibit a, exhibit b). 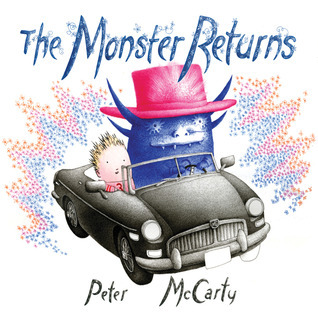 Sometimes when this happens I am stuck for a long time in the land of adorable, so I am happy to report that I am back with Picture Book 28, a little late, but so it goes. 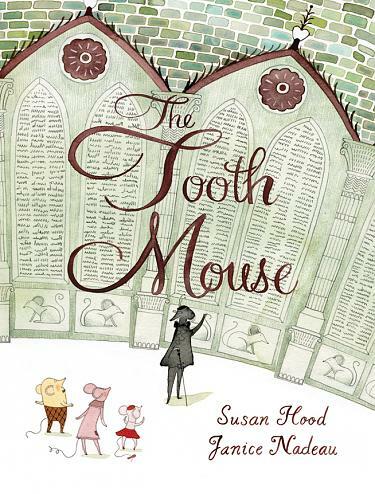 I think that The Tooth Mouse could be this kind of book for many young readers. It’s a sweet fable about the quest of one small mouse to become the successor to the old Tooth Mouse. Sophie, an orphan mouse, lives high up in an ancient cathedral in France. She is full of spirit and she has dancing feet. One day, when the Tooth Mouse announces she is too old to continue her work exchanging coins for children’s baby teeth, Sophie could not be more excited. She is sure she could be the next Tooth Mouse. But it is not so simple as wanting it. The Tooth Mouse has created three tasks that will reveal the best mouse for the job, one who is brave, honest, and wise. It turns out Sophie is all of these things. She trusts her heart and finds her way. Hood’s story and style is charming, old-fashioned but with enough flair to captivate a modern audience. The French asides scattered throughout add to the atmosphere and will surely add drama to story time. Who doesn’t love quest tales? There’s something supremely satisfying about seeing the cream rise to the top as the best mouse finds a way where others couldn’t. It’s a classic formula, and it’s done beautifully here. Speaking of beautiful, the softness coupled with the fine lines and detail in Janice Nadeau’s illustrations will inspire readers to slow right down and notice every whimsical moment. 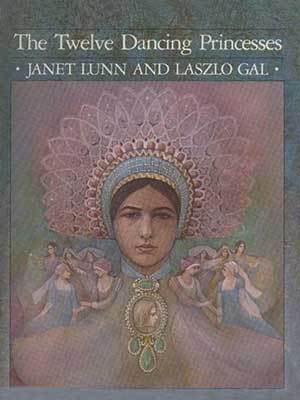 The illustrations make me feel like this story should be brought to life in another form as a ballet for children. A blend of old and new, familiar and quirky, The Tooth Mouse should live happily on children’s bookshelves (and in their laps) for a long, long time. The Tooth Mouse is published by Kids Can Press. This entry was posted in Can-Con, Illustration, Picture Books and tagged 30 Picture Books, Janice Nadeau, Kids Can Press, Susan Hood, tooth traditions on September 29, 2012 by shelfelf. There’s nothing better than a good breakfast. I can celebrate any meal of the day, but breakfast is perhaps the best. All breakfast lovers have their perfect brekkie. Mine is a sit-down, knife and fork, sausage and eggs and toast and jam and roasted tomato and bottomless coffee, kind of breakfast. Recently I had all that with sautéed mushrooms and some delish maple baked beans too. Now that was a breakfast. My ideal breakfast does not involve toads. EVER. Linda Bailey’s new picture book, Toads on Toast, should make readers consider branching out into new breakfast territory, away from Rice Krispies and PB on toast and oatmeal, all the way to something they might never have considered before: Toad in the Hole. Fox is tired of his usual recipe repertoire: “Catch a big fat toad. Bring it home. Skin it. Boil it. Eat it.” He needs a change. He finds inspiration at the cookbook store, in their extensive toad section. Apparently small, young, tender toads are where it’s at. One night, he captures some toadlets and brings them home. Just when things are about to get messy, Mamma toad arrives to save her babies and put a stop to Fox’s terrible plan. Mamma teaches Fox a secret family recipe for, you guessed it, Toad in a Hole. At first Fox is skeptical, but in the end, everything turns out deliciously. The book finishes off with a do-it-at-home recipe for Toad in a Hole (no toad required). I am crazy about the cover. Colin Jack got it absolutely right with this image. Each one of the toadlets has a different expression, from pleading to clueless to terrified. The little details are really funny – one toad’s buck teeth, another’s wee baseball cap, and the bow in one girl toad’s hair. You know just by looking that the story is going to get you laughing. Kids will be hooting before they even make it to the first page, for sure. Those hilarious details continue throughout, particularly when Mamma toad arrives and all the little ones start creating chaos in Fox’s kitchen (buttery food fights, cupboard climbing using pieces of licorice tied together, using a gravy boat for a slide…). Linda Bailey makes this one just as funny and sweet and kid friendly as her beloved Stanley books. Who knew toads could be so cute? I think I’ve mentioned before that a book gets immediate bonus points for me when it includes a recipe (or a whole stack of them). I like what the story suggests about the power of food to make friends of characters you’d never think could get along, let alone share a meal. Toads on Toast is a delightfully silly, culinary romp that should, like all the best dishes, get better and better the more times it’s enjoyed. Best served with breakfast. A final word on the glories of breakfast. Any breakfast fan should pop over to simply breakfast, the beautiful photography blog all about savouring the morning meal. 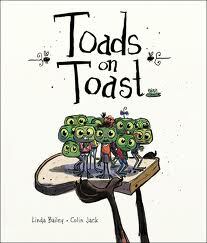 Toads on Toast is published by Kids Can Press. This entry was posted in General and tagged 30 Picture Books, Colin Jack, Kids Can Press, Linda Bailey, toad in the hole, toast on September 27, 2012 by shelfelf. Lemonade in Winter, by Emily Jenkins, illustrated by G. Brian Karas, follows Pauline and John-John, a bold sister and brother team, when they decide to have a lemonade stand in the middle of winter on a day when “a mean wind blows” and “icicles hang from the windowsills.” Their parents cannot dissuade them, indeed, nothing does. They hunt down all the loose change around their house, gather the ingredients from the corner store, make their drinks, and go out into the cold. Everyone thinks they’re crazy, but as it turns out, this doesn’t stop people in the neighborhood from stopping by. Throughout the story, Pauline tries to teach her little brother a thing or two about how money – and business – works. They bring in entertainment and decorations and decide to have a sale to inspire customers. In the end, they don’t make their money back, but they’ve learned a thing or two about making plans and making their own fun, seeing them through, and working together. The sibling dynamic is right on. Pauline is a little bit bossy, but well-meaning, with her “let me show you how to do this John-John” attitude. John-John goes along for the ride with all the enthusiasm you could expect from a little brother, and comes up with good ideas of his own. Lessons about how money works, and the basics of a shopping transaction get woven into the story with subtlety. The last page of the book explains the coins and offers tips on how to remember what is what (American currency). It’s lovely to see Jenkins capture how for kids, a big idea or goal, is often something small. She shows kids how to break down a goal into stages and make it happen. Of course it’s nice to see home made fun from ordinary family life being celebrated. Karas’s muted artwork, smudgy with snowflakes, soft and pale and frosty-looking, makes this winter day and cozy community, come vividly to life. Read about his artistic process for the book here. A great read for aspiring entrepreneurs and big dreamers, or for when the kids cry bored. 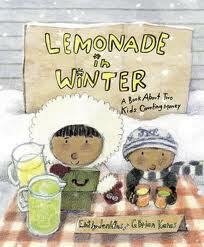 Lemonade in Winter is published by Schwartz and Wade. This entry was posted in Illustration, Picture Books and tagged 30 Picture Books, counting money, Emily Jenkins, G. Brian Karas, lemonade stand, Schwartz and Wade on September 26, 2012 by shelfelf. In the world of picture books, characters with unlikely dreams are almost as common as little girls who long to be ballerinas. Anne Marie Pace’s new picture book, Vampirina Ballerina, illustrated by the fantastic LeUyen Pham, is a charming addition that comes across as fresh and clever. Pace intersperses real ballet tips: “Once class begins, keep your eyes and ears open and your mouth closed”, with those essential to vampire ballerinas only: “The sight of your fangs might make the other dancers forget fifth position.” The take-home messages are sweet and true: have fun, practice, practice, practice, be yourself, and be brave. LeUyen Pham’s illustrations always look so stylish and classic, with oodles of panache and humour, like something you might see in an Oscar-winning animated French film. You can sneak a look a few of the illustrations at Pham’s blog, here. The soft, inky blues and greys Pham uses in her pictures of Vampirina’s home life work in beautiful contrast to the bright, light pinkness of the ballet school. Wonderful facial expressions appear on characters throughout as Vampirina stumbles and flubs her way towards her dream. And wait’ll you see Vampirina’s costume for her final recital. Think Black Swan, the mini-version. Vampirina Ballerina will get a standing ovation anytime, but it’s sure to be a star this Halloween. 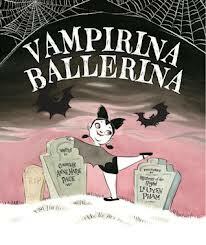 Vampirina Ballerina is published by Disney Hyperion. This entry was posted in Illustration, Picture Books and tagged 30 Picture Books, Anne Marie Pace, Disney Hyperion, goal setting, LeUyen Pham, vampire ballerina on September 22, 2012 by shelfelf.